ExpressVPN has announced updates to its popular Android, iOS and Windows VPN apps with a selection of new features designed to make protecting your privacy and hiding your identity online even easier. The new tools that have been added include improved leak protection, split tunnelling and more convenient ways to change your current location. The latest features are included in the new update and are free to existing ExpressVPN users. What are the New ExpressVPN App Features? One-Tap Location Swap – Aimed at making it easier to change your server location on the fly, this new addition gives you direct access to recent locations that you have used. In short, it lets you switch between your most popular choices without having to open up the menu. Split Tunnelling – The ExpressVPN app has introduced split-tunnelling, a handy way of choosing which apps you want to use your VPN with, and which you’re happy to continue using your standard ISP connection. 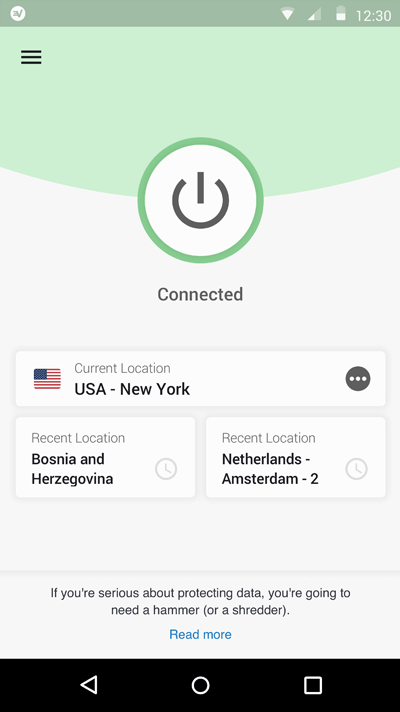 Return of the Widget – For the mobile apps, ExpressVPN has reinstated the widget, which allows you to connect and disconnect to the VPN, change location or check the connection status without having to open the app itself. Improved Leak Protection – For the Windows app, ExpressVPN have made the leak protection even more effective, increasing your security online. In our full ExpressVPN review, we noted that ExpressVPN already offered excellent protection, so stepping it up even more is impressive. New Diagnostic Information – If you’re a VPN fanatic who likes to look under the hood and see exactly what’s going on, good news. ExpressVPN have added a new diagnostic window so you can see exactly what is happening at all times. App Interface Overhaul – ExpressVPN has also given its apps a new design, making using the VPN even simpler than before, with an even more intuitive interface and fewer clicks to find what you want. A VPN is a tool that should be in every internet users arsenal. There’s a variety of reasons to use one, including protecting your identity and accessing information that would otherwise be locked off from you. A VPN is your key to the internet. Without it, there are plenty of sites that you can’t access, of if you can, don’t give you the full picture. Some sites are designed with certain regions in mind, and will block you if you’re visiting from outside. With a VPN, you can simply flick a switch to get access to that content. Then there’s your security. As a VPN bypasses your own ISP, it renders you anonymous online. This makes it much harder for you to be the target for hackers and scammers, not just at home, but if you’re using a public WiFi hotspot too. For more information, read our guide to the Best VPNs for 2019.